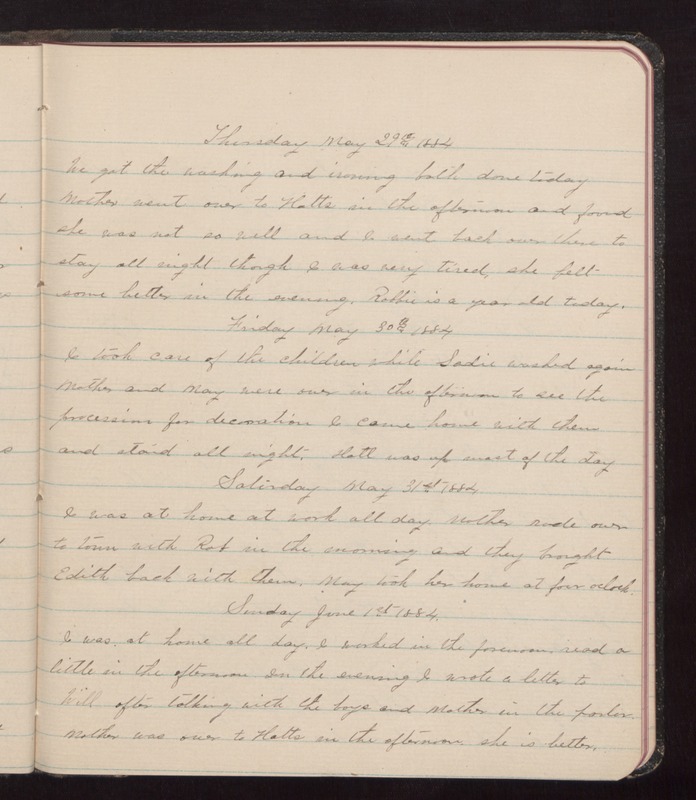 Thursday May 29th 1884 We got the washing and ironing both done today Mother went over to Hatts in the afternoon and found she was not so well and I went back over there to stay all night though I was very tired, she felt some better in the evening. Robbie is a year old today. Friday May 30th 1884 I took care of the children while Sadie washed again Mother and May were over in the afternoon to see the procession for decoration I came home with them and staid all night. Hatt was up most of the day Saturday May 31st 1884. I was at home at work all day. Mother rode over to town with Rob in the morning and they brought Edith back with them. May took her home at four oclock. Sunday June 1st 1884. I was at home all day. I worked in the forenoon, read a little in the afternoon. In the evening I wrote a letter to Will after talking with the boys and Mother in the parlor. Mother was over to Hatts in the afternoon, she is better.